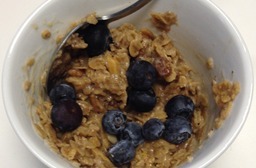 Nothing compares to warm oatmeal on a cold morning. Try it with your favorite White Rock Granola flavor and you'll never go back to plain oats again! 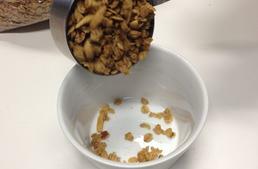 In a microwave safe bowl, measure out 3/4 of a cup of granola. We've chosen Orange Maple for this, although any flavor works well. Add 1/4 cup of milk (or water if you prefer) and microwave for 45-60 seconds on high. If you don't want to use the microwave, bring your milk to a boil on the stove. Once the milk is heated, pour over the granola, cover and let sit for 1-2 minutes. Stir the granola and let it sit for an additional 1 to 2 minutes. The mixture will thicken as it sits, and you can add more milk if needed. Mix in a handful of fresh fruit and enjoy!